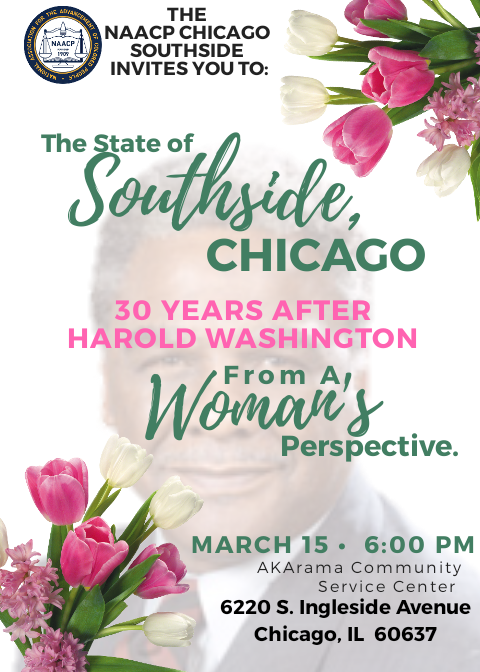 March 15th is right around the corner, now is the time for you to buy your ticket to attend the most conscious raising event of the year celebrating Women History Month, “The state of Southside Chicago…” We have assembled a panel of dynamic progressive women leaders that will explore solutions to the “Game Changing Issues” addressed by Mayor Washington’s administration, which still plague us today. For over a century, the NAACP Chicago Southside has been in the ranks pushing for the advancement of people of color as advocators, motivators, educators and litigators. We have done our part, now we need you to do your part. Purchase your tickets, which also includes an annual membership, click here.